To activate SimulScan, simply select it as an Input Plug-in from within DataWedge, an app that comes with every Zebra device. The exact process is detailed below, beginning with a short introduction to SimulScan concepts. For more information, see the About SimulScan page. At least one Template must be present and selected within SimulScan before the tool can be used; a number of generic Templates are included. For use cases in which generic or pre-built templates are unsuitable, custom Templates can be easily creating using the cloud-based Template Builder tool. See the Template Builder guide for more information about Templates. SimulScan includes a number of generic Templates to cover common scanning scenarios when SimulScan is selected as the DataWedge Input Plug-in. For more advanced use-cases, custom Templates can be created Using Template Builder or downloaded from Zebra's library of Pre-built Templates. Downloaded Templates can be modified as needed using Template Builder. Note: The names of all Templates included with SimulScan are preceded by the word "Default" plus a hyphen. 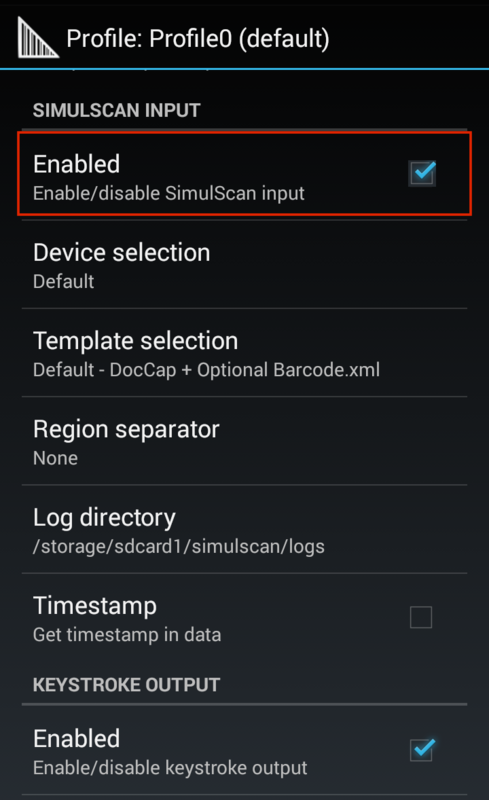 If using Templates already present on the device, skip to the "Activate SimulScan" section. Log in to the Template Builder web site. Select the Template type to create. Upload an image of the Document to be scanned (.bmp, .jpg, .png or PDF; 5MB max.). 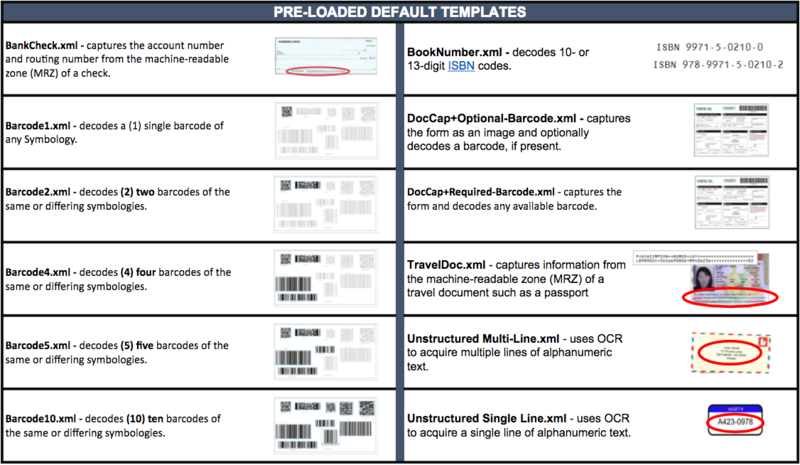 Identify regions of the Document and the data types (barcodes, text, etc.) of each. Validate Template to confirm that created fields are captured as intended. Save, Release and Deploy the completed Template(s), which can be downloaded to the development host (local PC). Copy Template(s) to /enterprise/device/settings/datawedge/templates on the device. Activate the Template from within DataWedge (see below) or other scanning app. When the desired Templates are stored on the device, activate SimulScan by setting it as the Input source when configuring an Input Plug-in (see below) in DataWedge. See the SimulScan Input section of the DataWedge documentation for full details. 1. Open DataWedge and the Profile that will use SimulScan. 2. Select "Input Plug-in," scrolling as necessary. Device Selection - permits selection of the device camera or the default scanning device set by the system (recommended). Template selection - sets a SimulScan Template for the Profile being configured. Custom Templates installed in the /enterprise/device/settings/datawedge/templates directory on the device will appear along with the templates included with SimulScan (listed above). Note: Files and folders within the /enterprise directory are invisible to Android File Browser by default; they can be made visible by manually inputting the path. Region separator - used to configure a separator character for SimulScan text-region data. When multiple text regions exist, the region separator will be inserted between the data strings from each region on the acquisition form. Region separators can be used with the Keystrokes Output Action key character setting (see below) to dispatch data acquired in SimulScan regions to specific fields of an app. Barcode, OCR and OMR regions are considered text regions. When using keystroke output and IP output, only text-region data will be dispatched to the foreground application or the remote server. SimulScan is now ready to use.